In the late 1640s and early 1650s, at the height of his artistic maturity, Nicolas Poussin turned from historical narrative to landscape painting. Landscape with a Calm does not illustrate a story but rather evokes a mood. The ordered composition and clear, golden light contribute to A Calm's utter tranquility, while glowing, gem-like colors and fluid paint strokes enliven this scene of benevolent nature. 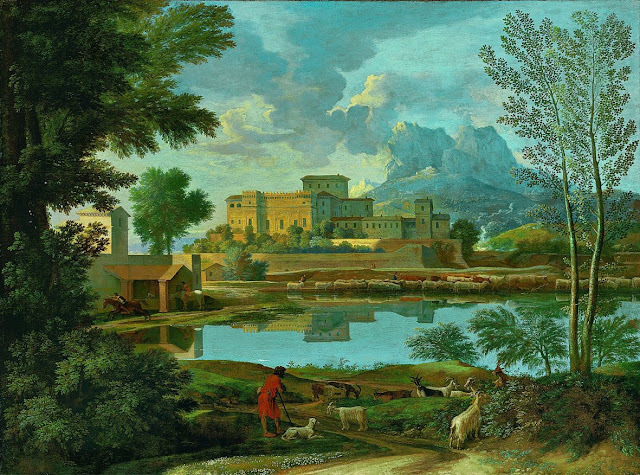 Poussin's sketching campaigns in the Roman countryside with his friend and fellow landscape painter Claude Lorrain account, in part, for its fresh observation of cloud-scattered sky and grazing goats. Poussin painted a pendant to this painting, Landscape with a Storm, now in a museum in Rouen. Together their contrasting weather effects embody nature's changing and unpredictable relationship with man. Poussin painted these works for the Parisian merchant Jean Pointel, a friend a great collector of his landscape paintings.